When I was little I thought Betty Crocker was a real person. I imagined she lived in the American heritage home pictured in my mother’s late ’50s edition of the complete Betty Crocker cookbook. She nimbly flitted round the primrose yellow and flamingo pink kitchen, pulling delicious things out of the enormous oven for her husband and kids. The brunch section of the cookbook was one of my favourites: I happily baked quick breads, popovers and muffins. But never pancakes. We were Dutch: pancakes meant dinner, not breakfast. Huge wheels of dough with bacon or cheese or apple and thick, glossy dark syrup, much closer to molasses than to delicate maple syrup. But in 2008 we were introduced to puffy American style pancakes at a Rhode Island bed and breakfast. Notwithstanding a healthy sprinkling of berries, they induced a carbs coma every time our hostess served them: we would nap straight after breakfast. Perhaps it was just greed. So eat these on a lazy Sunday, preferably in bed. Put all the dry ingredients in a bowl and mix thoroughly. Make a well in the centre. Whisk the eggs and add the buttermilk and oil. Pour into the well and mix lightly. The mixture may still be a little lumpy. Heat a large heavy frying pan or 2. Grease very lightly with oil and drop small ladlefuls of the batter into the pan. 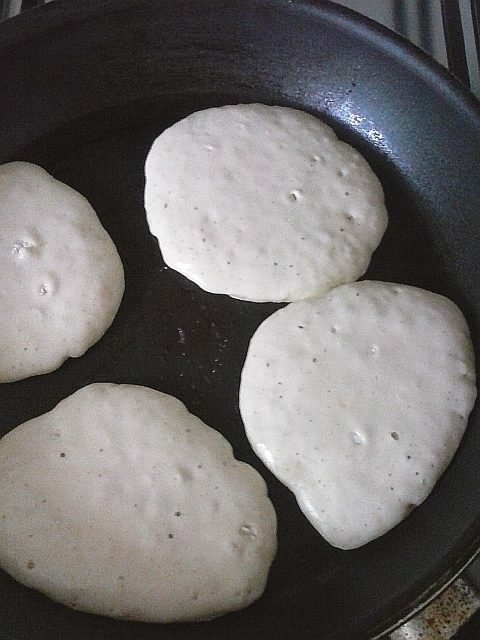 Turn down the heat to fairly low and cook the pancakes until bubbles form and the surface of the cakes is dry. Flip over and cook until done. Be patient and keep your eye on the heat: the pancakes should be medium brown by the time they are cooked. If the pan is too hot they will burn or you might be tempted to serve them raw, which is not recommended. Keep the pancakes hot on a plate over a pan of simmering water while you cook the next batch. 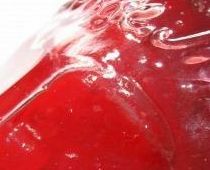 Serve hot with berries, melted butter and real maple syrup or icing sugar.